This started as a simple mod that allowed you to place a little marker on your items so you could remember to not accidentally sell or deconstruct them. Choose whether items are saved in general or uniquely - Save multiple stacks of the same item or give duplicates their own sets! 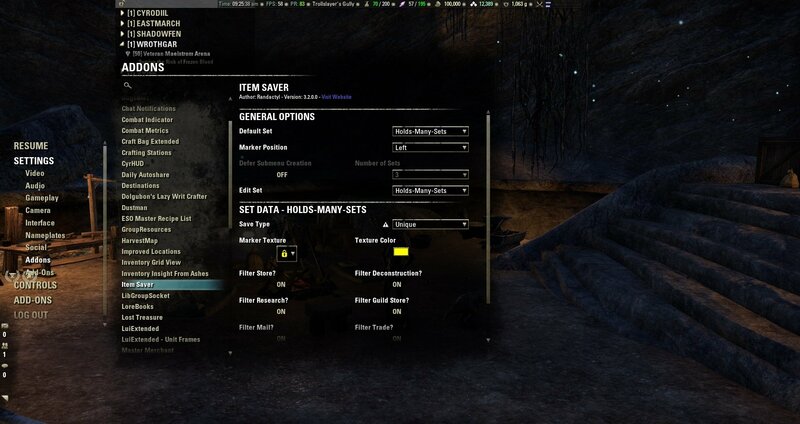 Choose to filter marked items from any combination of vendors, the deconstruction list, the research list, the guild store tell tab, the send mail window, and the trading window. Create as many different sets of items as you like, all with their own save type, marker texture, color, and filtering rules. 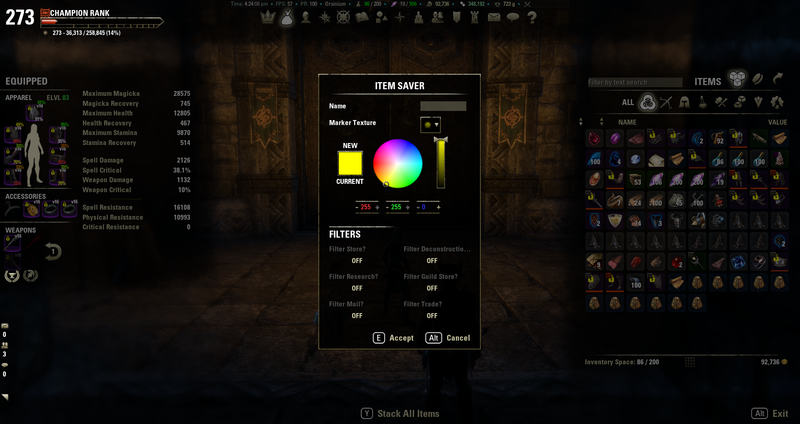 Add your own marker textures to use for Item Saver sets (details below). Create a new item set with the "+ Create Set" context menu option. Choose your set's name, save type, marker, color, and filters. Choose your default save set. Keybind for saving items to the default set. Choose one of nine possible marker positions. Item sets are listed in a submenu when right clicking an item. The context submenu can be deferred until there are more than a specified number of sets created (1 - 5). Edit created sets. Any changes will update immediately without needing a UI reload. Quickly clear all items from a set. Delete sets you no longer need. Want some more marker textures to choose from? Check out Item Saver - Advanced Filters Marker Textures or see below to create a new texture pack for yourself. It's super easy! --returns true if the set was successfully registered. --returns false if the set name is an empty string or already in use. --deconstruction, research, guildStore, mail, trade. --each will have a value of true if they are filtered or false if they are not. --returns preferred anchor position for markers. --returns texturePath, r, g, b if the item is saved. --returns nil if the item is not saved. --returns array of the names of available markers. --returns an alphabetically sorted array of the names of available save sets. returns a table with the full info of the provided set name. returns nil if the set doesn't exist. --the item is not saved. --if submenu creation is deferred. --returns false if submenu creation is not deferred. --returns true if the marker was successfully registered, false if it was not. --returns true if item was saved successfully. Returns false if item was unsaved. --if setName is nil, the default set will be used. The new API for adding marker textures takes its inspiration from Inventory Grid View's skins and Advanced Filters' dropdown filters. There are code examples in the markertextures folder in Item Saver's root directory. You may submit your markers as plugins for Item Saver on ESOUI. Go to http://www.esoui.com/downloads/info300-ItemSaver.html (this page). Click on "Other Files" between "Change Log" and "Comments"
Click on "Upload Optional Addon"
Enter all relevant information and attach a .zip file containing the folder that contains your plugin. Remember to include all readme and disclaimer information required by ZOS. Your title should retain the leading "Item Saver - " in order to keep things organized in the game's addon menu. ItemSaver must always be included in the DependsOn line. - temporarily disabled the color picker on the create set dialog box. Color will default to yellow and you can edit it in the settings menu after you've created a set. - made settings page more dynamic, removing the need to ever reload the UI when creating/deleting sets. - changed the way items are saved in the saved variables file. This allows duplicate items to be treated uniquely and keeps an item from "unsaving" when minor details like quality or enchantment change. Due to this change, you will need to re-save all of your items. If you need to see what you had saved previously, you can manually install version 2.4.0.0. - strings will now default to English if the client's language is unsupported. - update to libFilters v1.0r11. No functionality changes. - includes new version of libFilters which fixes runes being hidden if you've enabled the deconstruction filter. - The two functions I removed in 1.1 broke the keybind. Sorry! My mistake :( They have been readded. - Changed global function name from ItemSaver_IsSavedItem(bagId, slotIndex) to ItemSaver_IsItemSaved(bagId, slotIndex). - Reordered function declarations so ItemSaver_IsItemSaved should no longer produce an error. - Added French localization thanks to Khrill! -Updated to libFilters1.0r6 to fix a bug related to initialization... again. -Updated to libFilters1.0r5 to fix a bug related to initialization. -Added an option for a keybind; set your keybind in the Controls menu under "User Interface Shortcuts > Item Saver"
-Filters should now work correctly when toggling them from the settings menu. -Removed the "/itemsaver alternate" function. "/itemsaver filters" is still available for easy access. -Added a settings menu in which you can customize your icon, color and filtering options. -The "Save item" command should no longer show up for many windows that cause errors with it. -Fixed the add-on-breaking bug that broke the deconstruction menu filter. -The research list no longer needs to be reloaded when using "/itemsaver filters" to toggle the filter. -Changed the wording in the context menu from "Mark" to "Save". This IS ItemSAVEr, after all, not ItemMARKer! -Fixed an issue that caused the save context menu item to show up in the guild store browse and listing sections. -Applied filter on/off setting to the research window. -Marked soul gems realized that they were born to be used by you and now offer their services for weapon charging even if you have them marked. -Added "/itemsaver filters" to toggle the hiding/filtering for marked items. -Added saved setting for the filters, which defaults to OFF. -Added filtering to shops and deconstruction windows to make the marked items not show up at all in these windows. -Marked items will be "redded out" in the Research window, and the mouse will be disabled for that item. -With the previous two additions, added full support for the additional filters created by Advanced Filters. -Marker will now show up over the item in Grid View. -Fixed the error that happened when right clicking an inventory item. -Added equipped item (paper doll) support for the markers. -Added the marker to the list that pops up when choosing an item to research. Feature request: could the tags show in the transmute station please? The transmute station bag is named ZO_RetraitStation_KeyboardTopLevelRetraitPanelInventoryBackpack . 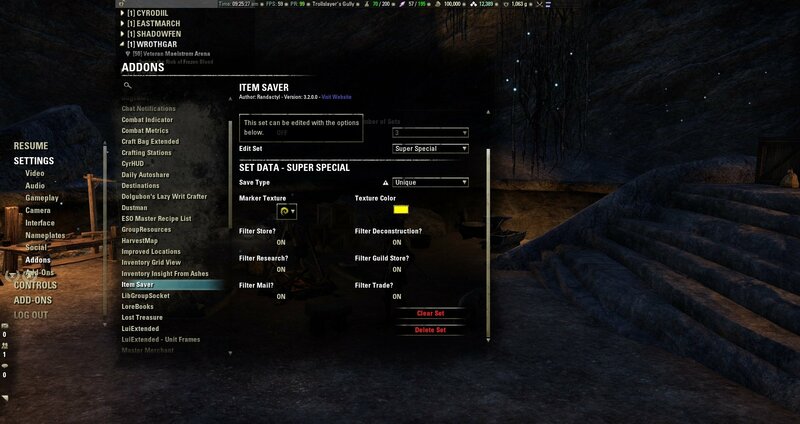 i save to a custom filter and items dissapear from Mail UI! Requesting an update for this addon as it's currently bugged. Filters don't work 100%. Even though I have filters on for my saved sets, I will still occasionally see them in my deconstructions/research lists. Anyone else have this bug? Is this addon outdated and to be replaced with another one? On logging in today after Dragon Bones patch, all my items were unlocked. All of my inventory was unsaved as well, I updated the API version, and while there were no errors, it did not change the unsaved status. I looked through the code, but did not see a cause. I hope someone else has an idea on how to get the saved status back without needing to save each item manually. Were you guys using the general (v. unique) marking format? Looks like ZOS must've changed some item IDs. I use 99% unique marks, hence my picture. My advice would be to use the unique marking format for all but consumables. Last edited by Kelnoreem : 02/14/18 at 01:02 PM. It is not consistent with the tooltips for the filters in the add on settings. I have seen different outcomes on each list I have setup, some are correct, some are backwards, but none of them are broken completely. EsoUI/Ingame/Inventory/InventorySlot.lua:718: Attempt to access a private function 'PickupInventoryItem' from insecure code. The callstack became untrusted 1 stack frame(s) from the top. Hovering over another item and back is a workaround, but it would be ideal if it just worked. Additionally, an undo keybind would be great for when mass marking items for deconstruction at the merchant or so, and you'd like to undo the last assignment which is now out of view due to being saved. Last edited by Majeure : 11/06/17 at 07:44 AM. Sounds like inconsistency in the game. I assume you're using the general (not unique) marking scheme? 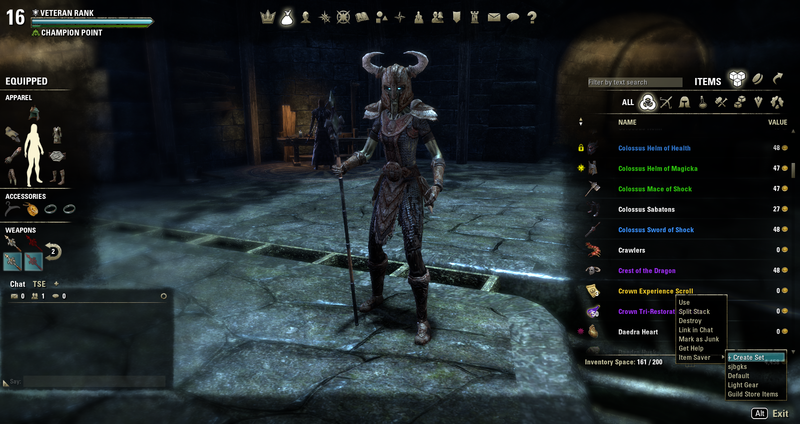 The two "different" writs must have the same item instance id (probably why 10 appears on the tooltip as well). I'm not following. AFAIK, it's filtering as intended both alone and with my full list of 100+ addons. i found this addon incompatibility with Mer Quick slot filters..
Can you reproduce with only the two in question enabled? I use quickslot filters with no issue.